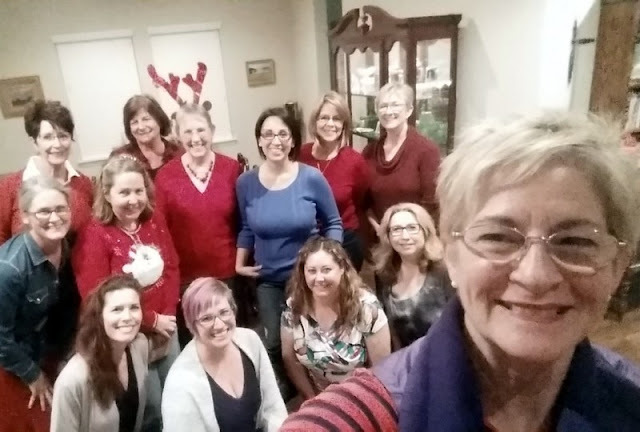 First Annual Christmas Party + December 2016 Meeting. 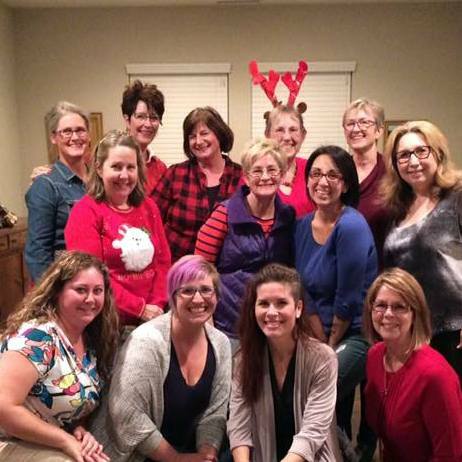 We had a great time last night at our First Christmas Party. At the end of the meeting, we decided to take a group photo. The first attempt was with the "selfie" method and the second was with a photo timer. I think they both turned out great. We had some "show and tell", everyone's' favorite. Jessica started some EPP! I made some fabric nesting bowls, the pattern is Nesting Fabric Bowls by Nova. I gave them to Jane, our outgoing guild president, as a gift. Colleen made this statement quilt that was accepted into Quiltcon 2017 in Savannah. We're all so proud of her. These photos are of the front, details and back of our Charity Quilt that we all made blocks for. Susan did the binding, do you notice how it changes fabric color? The finished quilt will go to GenerateHope in San Diego. Natalie will deliver it. Our gift exchange was zipper pouches. We had a terrific variety and I think everyone was pleased with the pouch they received! Our guild is small and just one year old, and we're a great group if I do say so myself! So exciting. I would have posted this on our FB page, but it's not a group page, yet! Yesterday I attended the Opening Reception of Modern Quilts: Redesigning Traditions at the Ontario Museum of Art and History. The exhibit runs through Sunday, January 22, 2017. Georgeanna Hawley curated the exhibit and she's long-armed two of my quilts. She invited me to the receptions so that we could finally meet, IRL! Below are some of the quilts from the exhibit and I encourage you to visit the museum if you have a chance. As I said, I hope you find the time to go to the exhibit. On January 17th from 6-8pm, Latifah Saafir, on of the founders of the MQG, is having a Trunk Show conjunction with this exhibit. It's free, but you need to call the museum and RSVP that you'll attend.